EghtesadOnline: Iran exported $100 million worth of hand-woven carpets during the first four months of the current fiscal year (March 21-July 22), registering an increase of 21.7% in value compared to last year’s corresponding period. The announcement was made by Fereshteh Dastpak, the head of Iran National Carpet Center, at the inauguration of the 27th Iran Handmade Carpet Exhibition on August 25. Dastpak told Financial Tribune on the sidelines of the show that the expo is the biggest hand-woven carpet event in the world. Intricately-woven Persian rugs of all kinds and designs are being showcased in more than 700 booths at the Tehran expo, according to Financial Tribune. According to the official, over 70 foreign traders from 26 countries are present at the exhibition, with whom the center has planned to hold B2B meeting to discuss trade. More than 670 companies in the domestic carpet sector are participating in the event. “We are looking into replacing the US, which is the biggest customer of Persian hand-woven carpets, with new countries,” she said. Iran’s export of handmade carpets to the US alone stood at $38 million during the first four months of the current year, which is up by 80.9% compared with last year’s same period. Dastpak explained that the huge rise in exports to the US relates to the time prior to the imposition of the new sanctions. The US banned the import of Iranian carpets, pistachio and caviar from August 6. 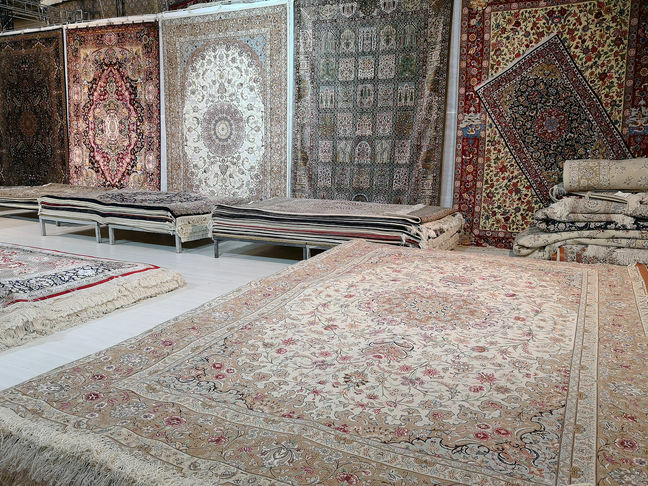 Statistics from the Islamic Republic of Iran Customs Administration show that in the last fiscal year (March 2017-18) carpet exports stood at $424 million, registering an increase of 18.11% year-on-year. Germany, Italy, the United Kingdom, Switzerland, Lebanon, the UAE, Kuwait, Qatar and Japan are other traditional buyers of Iranian carpets. According to Hamid Kargar, the former head of Iran National Carpet Center, new customers have emerged in recent years, namely China, Russia, South Africa and some Latin American countries. On the subject of jobs in the Iranian rug industry, the ex-official said 2.5 million people are currently working while around 6 million people earn their living through the carpet industry. The exhibition will run through August 31 and those interested can visit from 10 a.m. until 6 p.m. local time. According to Dastpak, one of the differences of this edition of the exhibition with the previous ones is that visitors are able to purchase carpets from the beginning of the exhibition through its end. Workshops on boosting exports have also been planned on the sidelines of the exhibition. Earlier, she said Iran is still the biggest producer and exporter of handmade carpets in the world, followed by India. Iran accounts for over 60% of global handmade carpet exports, Mehr News Agency quoted her as saying reported.